Sculpture in Stone (MFA), no. 008; Sculpture in Stone and Bronze (MFA), p. 106 (additional published references). 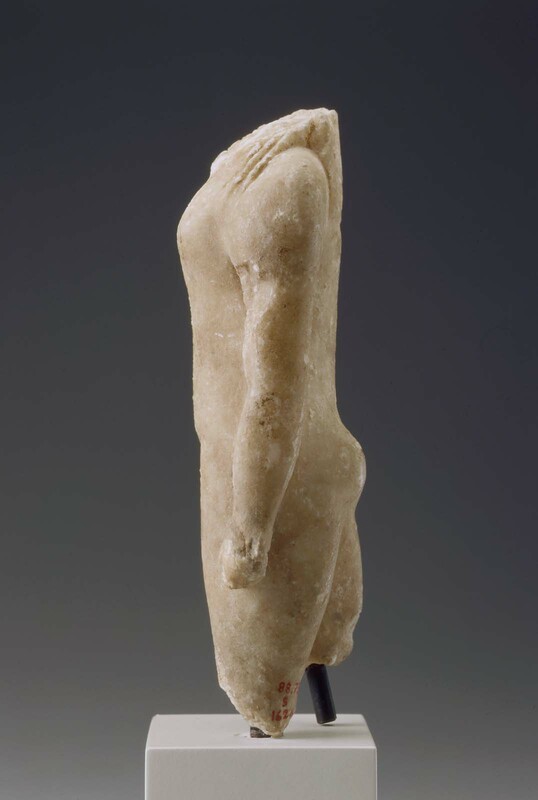 The statuette is an excellent illustration of how the proportions of monumental and miniature kouroi were interrelated, creating a similar visual effect regardless of the scale involved. 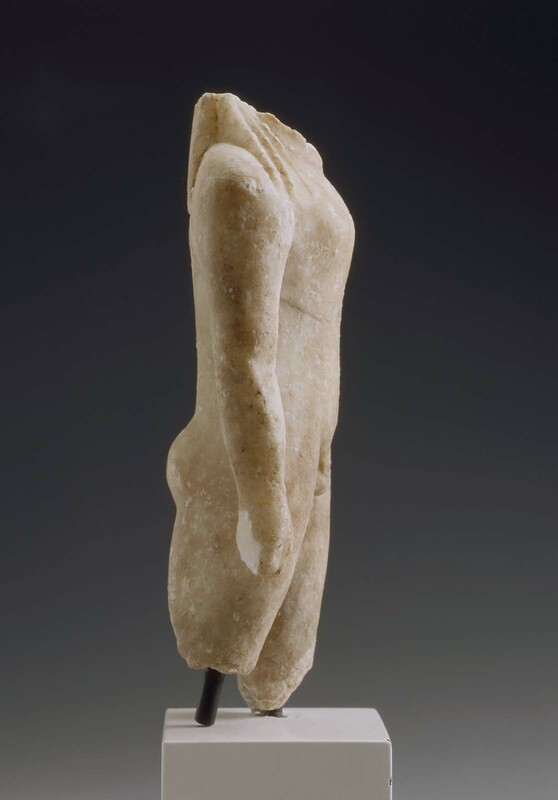 The yellowish patina and the crystals in the stone add to the attractiveness of this small figure. The head, part of the neck, and the legs from just above the knees are missing. The front of the left upper arm has been damaged. 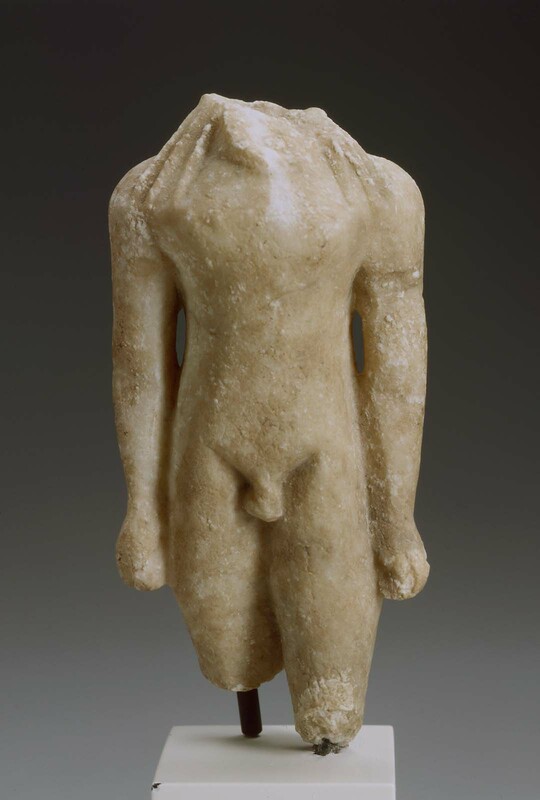 This statuette once possessed a head similar to that just described. The hair falls in three long straight locks at either side of the neck. At the back it lies flat and is cut off square between the shoulders, the strands being indicated by vertical incised lines. Abdominal muscles and navel are not indicated. Testing in 1999 determined that the material of this piece is gypsum. From Naukratis, Temenos of Aphrodite. 1886-7: excavated by William Matthew Flinders Petrie for the Egypt Exploration Fund, assigned to the EEF by the Egyptian government; December 22, 1887, presented to the MFA by the EEF. (Accession date: 1888).